Parrish AgriTurf has built and patented a one of a kind piece of equipment that can save you hours of work and hours of man power in the fields. Our Hay Accumulator can gather 10 bales of hay into one easy to manage row. It converts in just a few minutes, allowing custom accumulating of square bales that have already been baled and on the ground. It hooks behind any square baler in minutes without utilizing pumps or tractor hydraulics. The simple working mechanism makes this hay accumulator virtually foolproof. The simple design requires no timing, adjusting, or maintenance, it virtually runs itself. We hold the patent on several products so we are able to control how they are made and able to make sure that only high quality products go into each of our Hay Accumulator and Hay Grapples. The ease of use of our hay accumulator and hay grapple is unlike any other. And the cost is very much in most anyone’s budget. Our products are made here in our shop in Alabama. We don’t use a huge mass production line to make our units. Each one is done by hand so that we check every weld, every spring, and every screw to make sure it’s done correctly and that it’s up to our standards. If the weld doesn’t meet our standards, it won’t be going out of our shop . . . PERIOD! Parrish AgriTurf has built and patented a one of a kind piece of equipment that can save you hours of work and hours of man power in the fields. 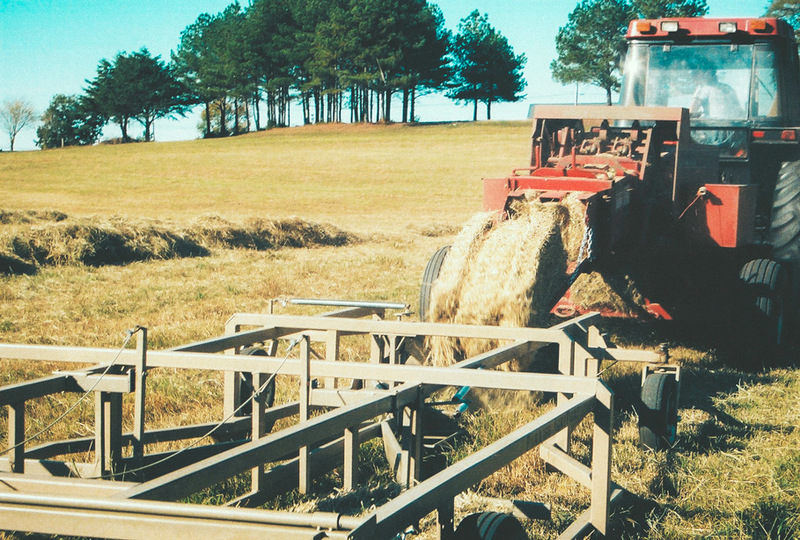 Our small bale Hay Accumulator can gather 10 bales of hay into one easy to manage row. It converts in just a few minutes, allowing custom accumulating of square bales that have already been baled and on the ground. It hooks behind any square baler in seconds without utilizing pumps or tractor hydraulics. This can be a life saver when the hydraulics go out on the tractor. The simple working mechanism makes this hay accumulator virtually foolproof. The simple design requires no timing, adjusting, or maintenance, it virtually runs itself.